The banana feeders at Rancho brought a multitude of species -- including this Chestnut-headed Oropendola -- in for close views. Photo by participant Alicia Jackson. There's no better cure for the winter blues than to head to a warm, sunny place where it's "summer" year-round -- where flowers bloom and butterflies flap, fruits hang heavy in the trees and birdsong echoes from the forest, even though it's only January. And if you can also spend a whole week at the same comfortable lodge (rather than living out of a suitcase), blow your diet on some fine food (including a full "Christmas turkey dinner") and start your year list with some real gems -- well, what more could you ask for? 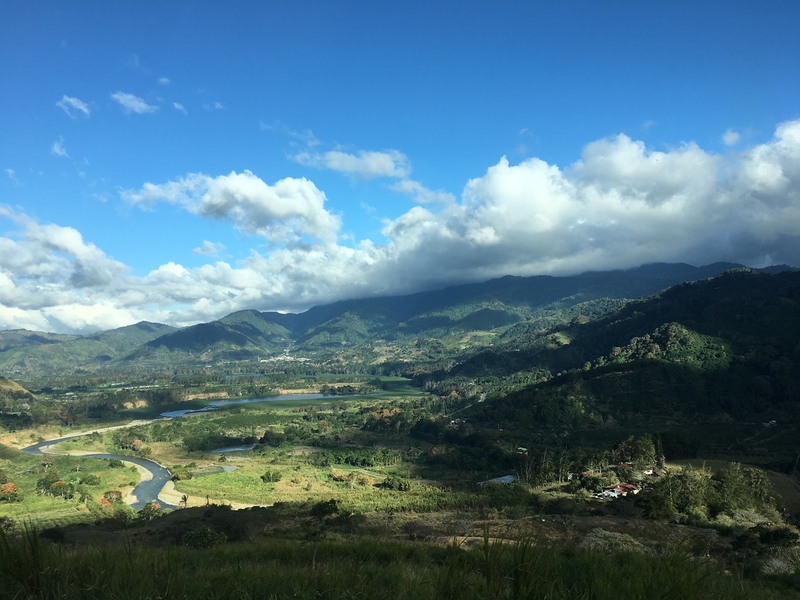 We divided our time between a plethora of habitats in the Caribbean foothills, and also ventured down into the Caribbean lowlands and up to the high slopes of Volcan Irazu on a couple of day trips. And boy, did we find some nice birds! 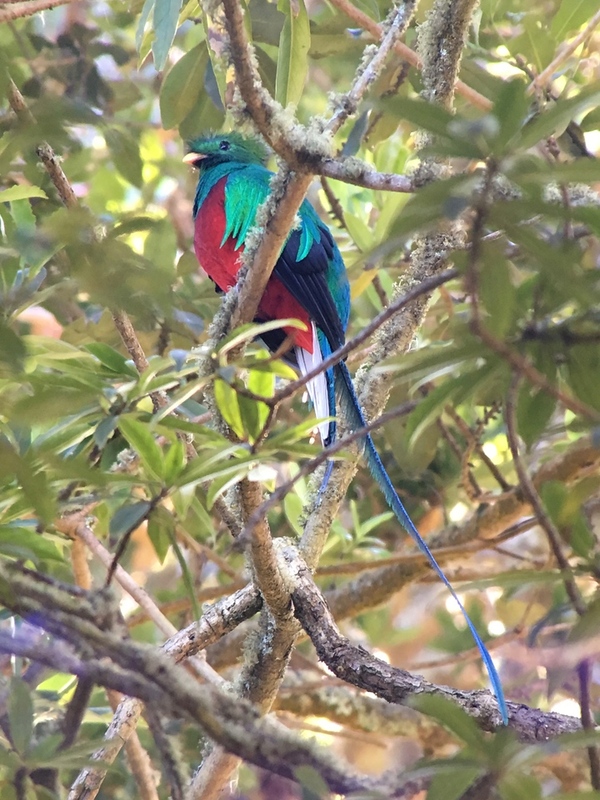 On the flanks of Volcan Irazu, we had fabulous views of a gorgeous male Resplendent Quetzal, calling from a moss-covered branch while his long, iridescent tail plume swayed gently in the breeze. A gently trickling stream near the road brought a Black-billed Nightingale-Thrush practically to our feet for a vigorously splashing bath. Several pairs of endangered Great Green Macaws flew noisily past over our heads, trailing their long tails behind them. Montezuma Oropendolas flipped themselves upside down in somersaulting courtship displays. Swarms of hummingbirds jousted around Rancho's feeders. A big, colorful mixed flock swirled along the edge of the Silent Mountain road -- Black-and-yellow, White-shouldered, Bay-headed, Golden-hooded, and Silver-throated tanagers mingling with Green Honeycreepers, Tawny-capped Euphonias and a handful of overwintering warblers. Two Hook-billed Kites soared against a blue, blue sky. A Sunbittern stepped delicately along a rushing stream, or stood -- swaying gently -- on boulders amid the water. Dozens of birds, including several tiny Snowcaps, many Violet-crowned Woodnymphs, a flashy Purple-crowned Fairy and an Orange-billed Sparrow flung themselves into the hummingbird pools while a pair of Tawny-throated Leaftossers scrabbled on the steep hillside by our viewing bench, flipping leaves. In the lovely gardens of Hotel Bougainvillea, a Rufous-naped Wren carried mouthfuls of plant material to its growing nest. A morning at the Rancho moth sheet brought repeated views of many normally shy forest species, including the range-restricted Tawny-chested Flycatcher, a couple of endearingly confiding White-breasted Wood-wrens, a noisy band of Red-throated Ant-Tanagers, a pair of Plain Antvireos, and an intent Buff-throated Foliage-gleaner as they searched for insects that had been attracted to the light overnight. A male White-capped Manakin sat quietly on an eye-level branch right beside a forest trail, showing his eponymous white cap to perfection. Purple Gallinules and Northern Jacanas tiptoed across pond surfaces on mats of floating vegetation. Lesson's Motmots flashed their stunningly iridescent head feathers. A Rufous-naped Wood-Rail poked along the sheltered edges of a tumbling stream. An American Dipper danced across a stone-filled creek, occasionally plunging into the torrent and disappearing from view. A trio of soggy Collared Aracaris sorted their feathers after a bath. And we certainly know now where every Chestnut-sided Warbler from North America spends the winter! An on-the-ground view of a Lesson's Motmot gave us a bird's eye view of its stunning crown and face. Photo by participant Bruce Sorrie. BLACK-BELLIED WHISTLING-DUCK (Dendrocygna autumnalis) – A half dozen or so stood in a driveway en route to Universidad EARTH, mingling with a gaggle of domestic ducks. Harry assures us they were wild birds! BLUE-WINGED TEAL (Spatula discors) – A busy group of 10 or so paddled in the middle of a trash-filled little creek at the edge of Tuis. LESSER SCAUP (Aythya affinis) – A few distant birds floated on Laguna Angostura, visible from our perch on the grassy hill in front of Casa Turire. GRAY-HEADED CHACHALACA (Ortalis cinereiceps) – Daily, including the big flock that made daily raids on the Rancho banana feeders. CRESTED GUAN (Penelope purpurascens) – Our first were a trio feeding high in some fruiting trees along the edge of the little stream at La Mina, but our best view probably came before breakfast one morning, when we found a quietly calling bird in a tree right over Wayne's driveway. PALE-VENTED PIGEON (Patagioenas cayennensis) – Regular in the lowlands on the day we visited Universidad EARTH, including numbers sprinkled on roadside wires and buildings, and others in the trees on the campus itself. Banded Peacock (Anartia fatima) was just one of the many butterflies we saw during the week. Photo by participant Alicia Jackson. RED-BILLED PIGEON (Patagioenas flavirostris) – Abundant throughout, with especially nice scope views of some on the grounds of the Hotel Bougainvillea. Despite its common name, the red on this bird's bill is restricted to a narrow band right at the base; the remainder of the bill is yellow -- as the scientific name indicates. INCA DOVE (Columbina inca) – One in the big dead tree on the grounds of the Hotel Bougainvillea showed us all sides as it pivoted on its branch. 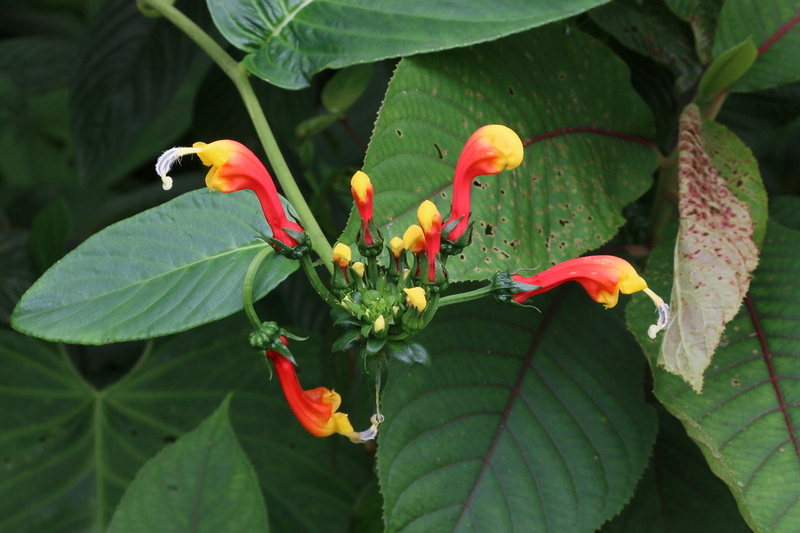 Despite its misleading common name, this species isn't found in South America; its describer meant to name them for the Amerindians found in part of Mexico -- the Aztecs! RUDDY GROUND-DOVE (Columbina talpacoti) – Another widespread species in more open areas of the foothills and lowlands, with especially good views of some busy flocks along the roadside at Universidad EARTH. WHITE-TIPPED DOVE (Leptotila verreauxi) – One trundled around under the feeders at Rancho on several mornings, one made a brief visit to the hummingbird pools, and we saw others on the grounds of the Hotel Bougainvillea. WHITE-WINGED DOVE (Zenaida asiatica) – Another fairly widespread species in more open areas, regularly seen perched on roadside wires throughout. We found a nest with two large chicks right near the entrance to the Hotel Bougainvillea -- tucked under the edge of the roof right where we loaded the bus. MOURNING DOVE (Zenaida macroura) – A few on the mid-slopes of Volcan Irazu, which is the only place on this tour route that they're found. The long pointed tails make them instantly recognizable, even at a distance. GROOVE-BILLED ANI (Crotophaga sulcirostris) – Another species that proved common in open areas, with some nice studies of those eponymous grooves on some birds in a weedy back pasture at Casa Turire. SQUIRREL CUCKOO (Piaya cayana) – Recorded on most days of the tour, with stunning views of one right near the top of the Rancho entrance road; as it bounded up the branches, we could certainly appreciate how it got its name! White-crowned Parrots were by far the tour's most common parrot, seen on all but one day. Photo by guide Megan Edwards Crewe. GREAT POTOO (Nyctibius grandis) – A bird snoozing on a day roost at CATIE was a treat. Mercedes, one of the lodge guides at Rancho, found the bird a few weeks before our trip, and the bird has stuck around. It was first identified as a Common Potoo, but examinations of the photos taken showed otherwise! WHITE-COLLARED SWIFT (Streptoprocne zonaris) – A huge swirling kettle of these big swifts circled over the road at Silent Mountain, and scores zoomed low overhead as we birded along the park road at Tapanti -- close enough we could clearly see their white collars. LESSER SWALLOW-TAILED SWIFT (Panyptila cayennensis) – A few of these distinctively marked black-and-white swifts flashed back and forth in the skies over the entrance gate at Universidad EARTH. When they wheeled around, they fanned their long, pointed tails -- which split to become "swallow tails". WHITE-NECKED JACOBIN (Florisuga mellivora) – Dozens jousted around the feeders on the Rancho balcony, and others visited the feeders at Wayne's. But we were most excited about one we found perched "in the wild" along the entrance road. GREEN HERMIT (Phaethornis guy) – Our first was foraging along the track at La Mina, but our best views came at the hummingbird feeders at Rancho and Wayne's, where single birds slipped in for quick visits. Females have longer white tail tips than males do. 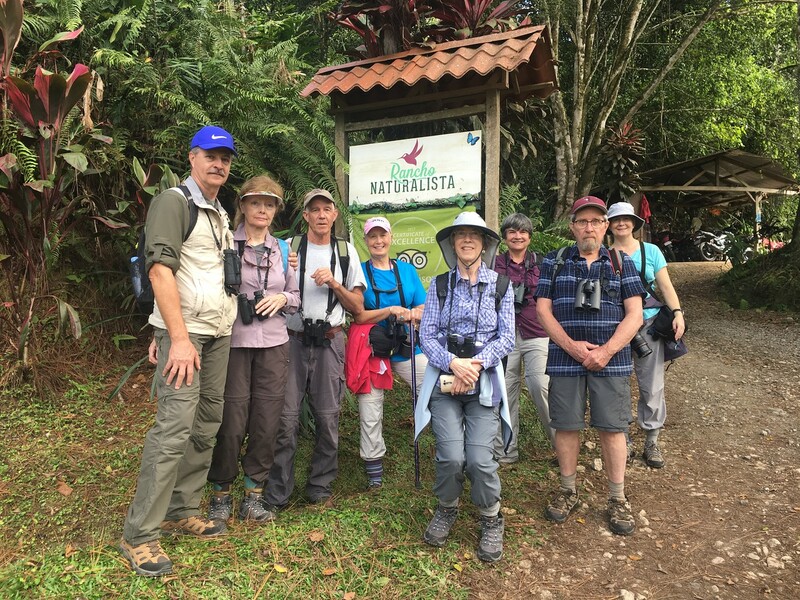 LONG-BILLED HERMIT (Phaethornis longirostris) – Many of the group saw one working along the edge of the road in the forest at Universidad EARTH. Its large size and long white tail tips are distinctive. GREEN-FRONTED LANCEBILL (Doryfera ludovicae) – One worked its way up a tangle of pinkish flowers in a tree along the Tapanti park road, winking in and out of view. LESSER VIOLETEAR (COSTA RICAN) (Colibri cyanotus cabanidis) – A visitor to the feeders outside our lunch spot on the flanks of Volcan Irazu proved frustratingly elusive for some. Fortunately, we found another far more obliging bird in the shady gully just outside Nochebuena. PURPLE-CROWNED FAIRY (Heliothryx barroti) – Our first foraged in a big tree near the entrance gate at Universidad EARTH, its distinctive long, white outer tail feathers flashing as it moved. We had even better looks at another plunge-bathing at the Rancho hummingbird pools a couple of days later. GREEN-BREASTED MANGO (Anthracothorax prevostii) – Regular at Rancho's feeders and at Wayne's (though never as numerous as the jacobins), with others at Universidad EARTH. GREEN THORNTAIL (Discosura conversii) – Our first was a little male feeding very low in a vervain hedge just outside Kathy's house -- until he was chased away by the resident bully boy Rufous-tailed Hummingbirds, that is! We found another feeding in the flowering tree just outside the main building at Rancho. The pointed shafts that stick out beyond the male's tail feathers give the species its common name. BLACK-CRESTED COQUETTE (Lophornis helenae) – Harry spotted one high in a yellow flowering tree at the edge of the forest near the entrance to Universidad EARTH, and a few folks managed to see it in the scope before it shot off. GREEN-CROWNED BRILLIANT (Heliodoxa jacula) – Maggie was the lucky one on the Rancho balcony when one showed up there one morning, and the rest of us caught up with another female at Wayne's on our first visit there. TALAMANCA HUMMINGBIRD (Eugenes spectabilis) – One at the feeder outside the restaurant at Nochebuena (on the flanks of Volcan Irazu) proved a bit elusive, vanishing as soon as it saw a face at the window. Fortunately, another in the nearby gully was more cooperative. FIERY-THROATED HUMMINGBIRD (Panterpe insignis) – Another highland specialty, seen well on Volcan Irazu. One foraging among the flowers of a shrub in the gully at Nochebuena showed flashes of its fiery throat as it twisted and turned in the sunlight. WHITE-BELLIED MOUNTAIN-GEM (Lampornis hemileucus) – We spotted a female foraging among some pink flowers in a tree along the Tapanti park road. PURPLE-THROATED MOUNTAIN-GEM (Lampornis calolaemus) – A male, perched very low in a tangle along the Tapanti park road, sat stock-still while everybody got multiple looks in the scope. VOLCANO HUMMINGBIRD (Selasphorus flammula) – Abundant on Volcan Irazu, particularly around the crater. We had plenty of scope studies, particularly of males perched up on little dead sticks jutting out of the bushes near the path up to the overlook. VIOLET SABREWING (Campylopterus hemileucurus) – Single birds visited the Rancho balcony on several mornings -- always quickly noticed due to their large size and flashing white tail tips -- and we saw another at Wayne's. It wasn't just birds getting all the attention during the week -- plants were being checked out too! This one is Piper friedrichsthalii, one of the pepper plants. Photo by participant Bruce Sorrie. BRONZE-TAILED PLUMELETEER (Chalybura urochrysia) – Surprisingly common this week, including a trio chasing each other around on the other side of the little creek at La Mina, one in the primary forest at Universidad EARTH and another at Wayne's. This is Costa Rica's only red-footed hummingbird. CROWNED WOODNYMPH (Thalurania colombica) – Some truly spectacular looks at birds at arm's length at the Rancho balcony feeders. We could have reached out and touched the male that perched each morning on sticks right beside the porch. We saw others around Wayne's feeders, plus plenty plunge-diving at the hummingbird pools; they're surely the cleanest hummingbirds in the forest! BLACK-BELLIED HUMMINGBIRD (Eupherusa nigriventris) – Great views of several males foraging along the park road at Tapanti, showing their black bellies and rusty wing patches nicely. This is a Chiriqui endemic, found only in the highlands of Costa Rica and neighboring western Panama. SNOWCAP (Microchera albocoronata) – From the males buzzing over the vervain hedges at Kathy's, to the birds dunking themselves in the hummingbird pools, to the males visiting the flowers outside the main building at Rancho, we saw these gorgeous little birds on most days of the trip. This is a very range-restricted species, and Rancho is one of the best places on the planet to see them! BLUE-CHESTED HUMMINGBIRD (Amazilia amabilis) – Bruce was the lucky one who happened to be standing next to Harry when he got one in the scope. It was zipping around the bright yellow flowers at the top of a big tree at the edge of the clearing by the entrance to Universidad EARTH. STEELY-VENTED HUMMINGBIRD (Amazilia saucerottei) – One on the grounds of the Hotel Bougainvillea, seen by some of the group as we jockeyed for position with the other birding group in the same area. RUFOUS-TAILED HUMMINGBIRD (Amazilia tzacatl) – Abundant throughout, and seen well on every day of the tour. The ones at Kathy's were particularly persistent in their attempts to keep the Snowcaps away from "their" flowers. RUSSET-NAPED WOOD-RAIL (Aramides albiventris) – One rummaging along the edge of the creek near La Mina -- and occasionally having a bit of a splash in the water -- showed nicely, once it ventured out from under the bushes. This species was split out from the former Gray-necked Wood-Rail complex. PURPLE GALLINULE (Porphyrio martinica) – A handful strode around on the lily pads at CATIE, and others did the same on the Water Hyacinth at Casa Turire. We saw a few brownish youngsters as well as the bluer adults. 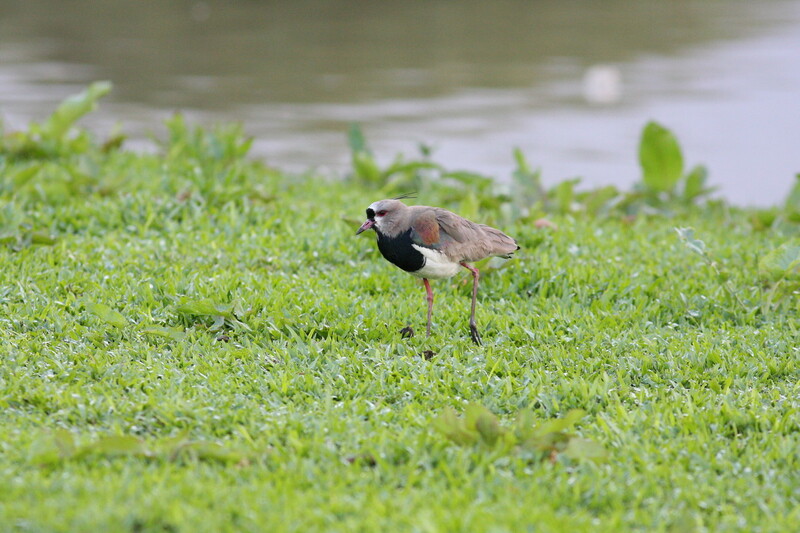 Southern Lapwing is a relatively recent arrival to Costa Rica, first recorded in 1997. Photo by participant Bruce Sorrie. SOUTHERN LAPWING (Vanellus chilensis) – A couple of birds pattered along the edge of one of the horse pastures at Casa Turire, not far from the mare and her fairly new foal. This species is a relatively new arrival in Costa Rica, spreading north as the forests were cleared for pasturelands. NORTHERN JACANA (Jacana spinosa) – Abundant at CATIE, where dozens tiptoed across the lily pads, showing off their distinctively long toes. There were many youngsters, still sporting their brown-and-white plumage and striped faces even though they were now old enough to fly. SPOTTED SANDPIPER (Actitis macularius) – One bobbed on the rocks in the middle of the little stream at La Mina on each of our visits, and another worked its way along the creek on the Silent Mountain road. 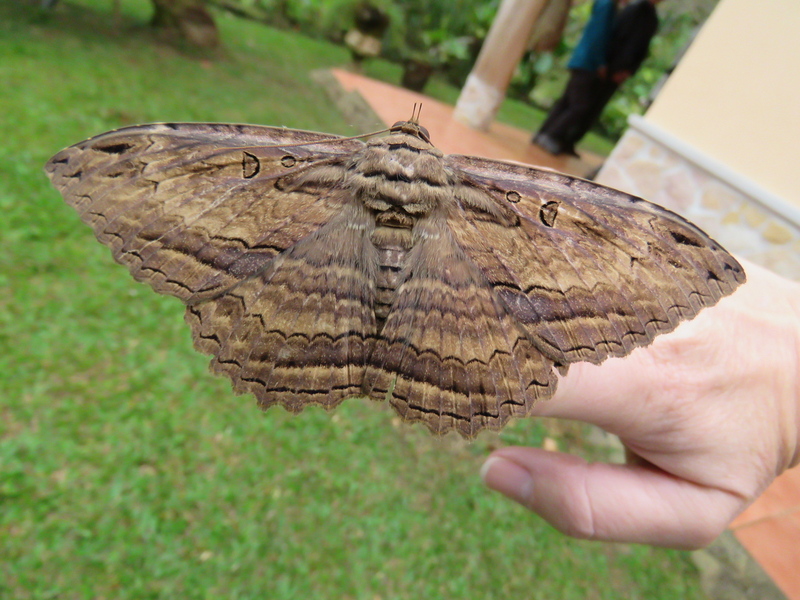 This is a winter visitor to Costa Rica. SUNBITTERN (Eurypyga helias) – Shelly spotted our first, balanced on a rock along the edge of the creek at La Mina. Fortunately for Linda (who'd skipped that outing), we found an even closer pair in the creek along the Silent Mountain road the next day -- and they hopped and skipped their way along the water's edge, flashing those amazing wings. We found another in a trash-filled little rivulet right on the edge of Tuis. Does that make it a trash bird?! WOOD STORK (Mycteria americana) – One glided past while we birded the edge of Laguna Angostura, headed for the other side of the reservoir. This is a fairly uncommon species on our tour route. ANHINGA (Anhinga anhinga) – A rather wary bird sat in a tree along the edge of the lake at CATIE, drying out. 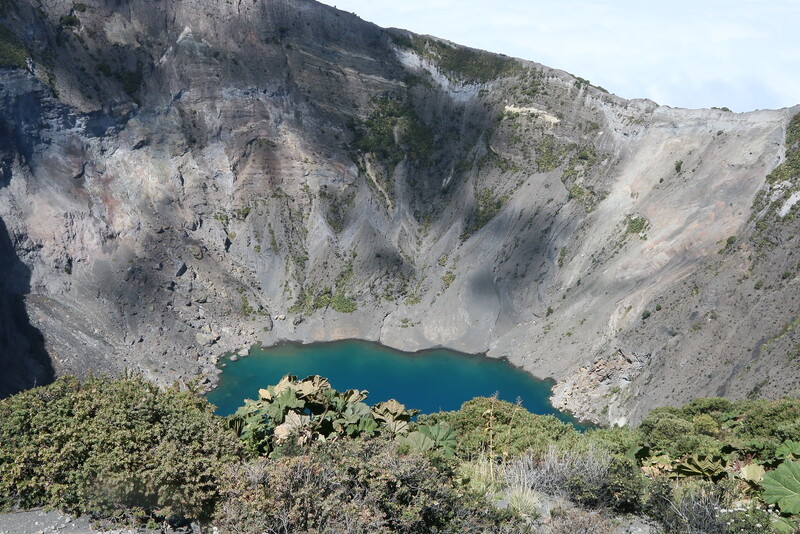 It's not often we see the crater lake at Volcan Irazu in bright sunshine! Photo by participant Bruce Sorrie. NEOTROPIC CORMORANT (Phalacrocorax brasilianus) – Singles flew past over Laguna Angostura, headed for roost trees at the edge of the water; by the time we left, there were at least a dozen sprinkled among the branches, with others on scattered islets in the water itself. FASCIATED TIGER-HERON (Tigrisoma fasciatum) – One hunted in the rushing stream by the big suspension bridge at Universidad EARTH, peering intently into the water. GREAT BLUE HERON (Ardea herodias) – One stood on the shore on the far side of Laguna Angostura; this is a winter visitor to Costa Rica. GREAT EGRET (Ardea alba) – Common throughout the tour, with small numbers in scattered spots along our drives (including that trashy little stream in Tuis), and others hunting the edges of Laguna Angostura. This is a resident species, though numbers swell in the winter with visitors from further north. SNOWY EGRET (Egretta thula) – Seen in nice comparison with the previous species in that little creek at the edge of Tuis, with others sprinkled on the fringes of Laguna Angostura. LITTLE BLUE HERON (Egretta caerulea) – An adult tiptoed through that trashy stream in Tuis, and we saw others -- including some white youngsters -- along the edges of Laguna Angostura. CATTLE EGRET (Bubulcus ibis) – Daily, including flocks flashing like confetti against the hillsides visible from the Rancho balcony as they commuted up the valley each morning, and dozens hovering around the horses in a pasture near Casa Turire. GREEN HERON (Butorides virescens) – We flushed one several times along the stream at La Mina (briefly raising hopes of Sunbittern on our first visit), and spotted another with the cohort of herons on that rubbish-filled little stream in Tuis. BLACK-CROWNED NIGHT-HERON (Nycticorax nycticorax) – At least two adults and one speckly youngster in trees around the lake at CATIE. YELLOW-CROWNED NIGHT-HERON (Nyctanassa violacea) – A few in some of the bigger trees around the lake at CATIE, with another hunting along the edge of Laguna Angostura as dusk approached. With a view like this, it's easy to see why this species is called Red-throated Ant-Tanager. Photo by participant Alicia Jackson. BOAT-BILLED HERON (Cochlearius cochlearius) – It took some patience -- and some careful scanning -- but we finally located one of these truly nocturnal herons tucked among the papyrus on the far side of the lake at CATIE. It was so hidden that it was little more than a gray blob, though we did finally see its big dark eye and a bit of that shovel-shaped beak through the scopes. GREEN IBIS (Mesembrinibis cayennensis) – Quite common this trip, and seen well on several days, including a little group blinking in a leafless tree in someone's backyard early on our drive through the Tuis valley one morning, and a pair foraging on the grassy edge of the road through the Universidad EARTH campus. BLACK VULTURE (Coragyps atratus) – Daily, often in sizable numbers. TURKEY VULTURE (Cathartes aura) – Also daily, though in smaller numbers than the previous species. OSPREY (Pandion haliaetus) – One sat high in a tree along the edge of Laguna Angostura, and a second flew past carrying a fairly good-sized fish. WHITE-TAILED KITE (Elanus leucurus) – One seen hovering as we waited for the group to gather on the morning we left San Jose for the mountain. HOOK-BILLED KITE (Chondrohierax uncinatus) – Two circled over Kathy's as we made our way back towards the bus, and we even better looks at another over the little marsh near Platanillo the following morning. That massive, wickedly-pointed beak is tailor-made for extracting snails from their shells. GRAY-HEADED KITE (Leptodon cayanensis) – Some of the group had brief views of one as it flapped across the road at Universidad EARTH; unfortunately, it quickly disappeared into the thick forest and wasn't seen again. We heard another calling from the forest along Rancho's Pepper trail. SNAIL KITE (Rostrhamus sociabilis) – A handful hunted around the margins of Laguna Angostura, their white rumps flashing as they turned in the air. This species is a relatively new arrival to the Tuis valley, arriving only after the reservoir was completed. The gang at Rancho. Photo by guide Megan Edwards Crewe. ROADSIDE HAWK (Rupornis magnirostris) – The most common raptor of the trip, seen most days -- including one perched along the Rancho entrance road on our first morning's walk there, and another in an eye-level treetop near the start of the road to La Mina. HARRIS'S HAWK (Parabuteo unicinctus) – So it turns out we were right about the young bird we spotted at Casa Turire -- Harry emailed me to say that a young bird was photographed and reported on eBird a few days after we spotted ours. GRAY HAWK (Buteo plagiatus) – Our first was a youngster seen along the road as we drove towards Universidad EARTH. We spotted a couple of circling adults from the Rancho balcony later in the week. BROAD-WINGED HAWK (Buteo platypterus) – Regular throughout most of the week, including an adult and a youngster soaring around together over the little marsh outside Platanillo on our second visit there. SHORT-TAILED HAWK (Buteo brachyurus) – One soared over the summit at Volcan Irazu, its white underside flashing against the blue, blue sky, and we spotted another one circling over CATIE. RED-TAILED HAWK (Buteo jamaicensis) – A few over the lower flanks of Volcan Irazu, another along the Silent Mountain road, and a final bird over Tapanti. The resident subspecies found in Costa Rica -- costaricensis -- has a rufous belly band. MOTTLED OWL (Ciccaba virgata) – Arg! Rancho's local pair were less than cooperative this week, unfortunately. We heard them well on several nights, hooting from the darkness of the trees along the entrance road. Seeing them proved to be a bit more of a challenge though, and most folks only saw one fly through the spotlight beam. The lucky few got a look at one high in some overhead branches before it flew. RESPLENDENT QUETZAL (Pharomachrus mocinno) – We had splendid views of a gorgeous male -- sporting only a single long tail plume -- on the flanks of Volcan Irazu. Yahoo! SLATY-TAILED TROGON (Trogon massena) – We heard one calling along the forest track at Universidad EARTH, and were eventually able to track it down for some scope views. The all-dark undertail of this species is diagnostic. 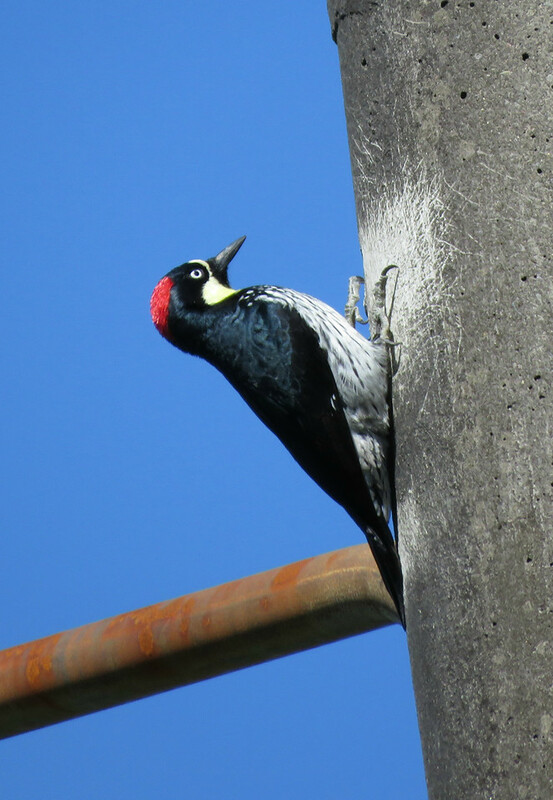 It's obvious from the scratch marks on the concrete telephone pole that this Acorn Woodpecker has visited before! Photo by participant Alicia Jackson. GARTERED TROGON (Trogon caligatus) – One along the Rancho entrance road, with even better views of a pair over the stream at Universidad EARTH -- distracting us from our search for the also-calling woodpeckers! This is the smallest of Costa Rica's trogons. LESSON'S MOTMOT (Momotus lessonii lessonii) – Gratifyingly common, including several on the grounds of the Hotel Bougainvillea and others around the banana feeders at Rancho. 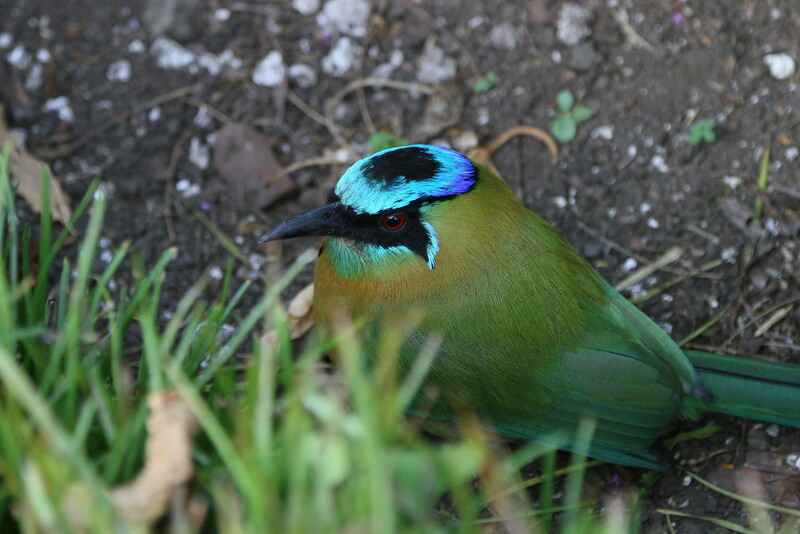 This handsome species was recently split from the Blue-crowned Motmot complex. RUFOUS MOTMOT (Baryphthengus martii) – Bruce was the lucky one who spotted one along the Rancho entrance road before breakfast one morning. 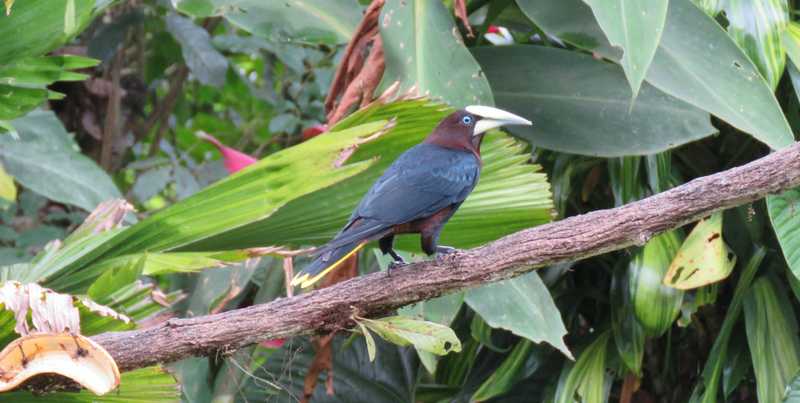 This species (Costa Rica's largest motmot) looks a bit like a super-sized Broad-billed Motmot. BROAD-BILLED MOTMOT (Electron platyrhynchum) – One at Universidad EARTH -- seen between the two bridges -- with another along the Pepper trail at Rancho. We heard the throaty "awnk" call of this species on several days. RINGED KINGFISHER (Megaceryle torquata) – A couple at Laguna Angostura: one perched over the edge of the lake, and a second flying past with a rattling call. AMAZON KINGFISHER (Chloroceryle amazona) – We had scope views of one perched over some riffles in the biggest creek at Universidad EARTH (seen while we walked across the bridges), and another flew past while we birded along the stream at La Mina. This species is larger than the next, and lacks the white-speckled wings of its smaller cousin. GREEN KINGFISHER (Chloroceryle americana) – Best seen at La Mina, where a pair hunted from boulders in the middle of the stream, not far from where we found our wood-rail. We saw others at Universidad EARTH. WHITE-NECKED PUFFBIRD (Notharchus hyperrhynchus) – Some great spotting by Lisa netted us long scope views of one sitting high in a tree along the edge of the forest on our way out of Universidad EARTH. This is a fairly uncommon species in lowland Costa Rica. RUFOUS-TAILED JACAMAR (Galbula ruficauda) – Unfortunately, though we heard one calling (and calling and calling) along the Pepper trail and another from somewhere within earshot of Rancho's pasture, we could entice either one out to where we could see it. RED-HEADED BARBET (Eubucco bourcierii) – A female near the visitor's center at Tapanti got our morning there off to a nice start -- great spotting, Alicia! Though she lacks her mate's red head, the female barbet is still pretty snazzy, with a golden crown and collar, and a powder-blue cheek. PRONG-BILLED BARBET (Semnornis frantzii) – Super views of a trio along the Tapanti park road; they were taking turns sitting on an open branch in a tree just uphill between bouts of feeding on some small nearby fruits. Recent DNA studies have shown that these New World barbets are actually more closely related to the toucans than they are to the Old World barbets! COLLARED ARACARI (Pteroglossus torquatus) – Some great views of preening birds in the trees right outside Rancho's main building on our first morning there; a trio sorted their soggy feathers (they'd clearly just bathed somewhere!) in the early-morning sunshine. We saw others on our drive to Universidad EARTH, and heard more hiccuping from the forest along Rancho's Pepper trail. YELLOW-THROATED TOUCAN (CHESTNUT-MANDIBLED) (Ramphastos ambiguus swainsonii) – Common at Universidad EARTH, including a few checking out fruiting trees near the bridges. This species was formerly called Chestnut-mandibled Toucan, but has now been lumped with the former Black-billed Toucan of South America. KEEL-BILLED TOUCAN (Ramphastos sulfuratus) – Common throughout, seen or heard on all but our first day -- including some seen right from the balcony at Rancho. Is anybody hungry for Fruit Loops? ACORN WOODPECKER (Melanerpes formicivorus) – Common on the flanks of Volcan Irazu, with especially nice views of a few near the bridge where we found our Long-tailed Silky-Flycatchers. We saw plenty of evidence of their presence in the nearby telephone poles! BLACK-CHEEKED WOODPECKER (Melanerpes pucherani) – Common throughout, including one hitching its way up a tree trunk along the Rancho entrance road our first morning there, and others near Wayne's feeders. HOFFMANN'S WOODPECKER (Melanerpes hoffmannii) – Best seen on the grounds of the Hotel Bougainvillea our first morning, with others at Casa Turire and La Mina. The pale face of this species is distinctively plain. 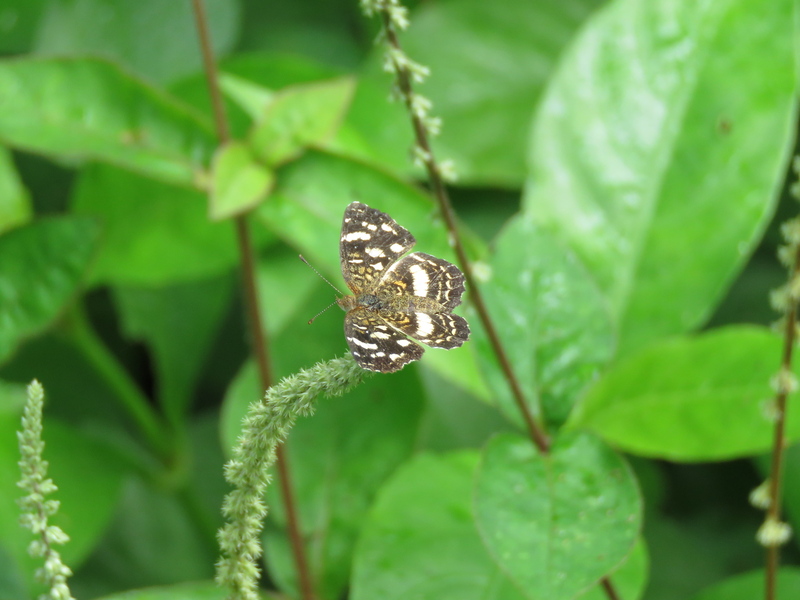 We had some stunning views of Sunbitterns along the Silent Mountain road. Video by guide Megan Edwards Crewe. LINEATED WOODPECKER (Dryocopus lineatus) – One at CATIE showed nicely -- eventually -- after first peeking around the far side of the palm trunk it was clinging to. CHESTNUT-COLORED WOODPECKER (Celeus castaneus) – We heard this one calling for long minutes at Universidad EARTH before it finally swooped into view. Unfortunately, it stuck to the higher parts of the overhanging trees, which made it a bit of a challenge to follow as it moved through. RUFOUS-WINGED WOODPECKER (Piculus simplex) – One of these uncommon woodpeckers was seen along the road in the forest at Universidad EARTH. GOLDEN-OLIVE WOODPECKER (Colaptes rubiginosus) – Our first showed nicely among the guava trees in Rancho's pasture, and we had wonderful close looks at another foraging near Wayne's feeders on our second visit there. BARRED FOREST-FALCON (Micrastur ruficollis) – We heard one calling, poodle-like, from the Rancho balcony early on our first pre-breakfast meet-up there. CRESTED CARACARA (Caracara cheriway) – Bruce spotted our first as we drove towards Volcan Irazu, and we saw another en route to Universidad EARTH and a final one striding around on the far side of Laguna Angostura. YELLOW-HEADED CARACARA (Milvago chimachima) – A few scattered birds, including one in flight over the little marsh near Platanillo. This is a relatively recent arrival to the country, first reported in 1973; it has since spread across most of Costa Rica as forests are cut down to make pastures and agricultural fields. LAUGHING FALCON (Herpetotheres cachinnans) – One Harry spotted on our drive back from Universidad EARTH showed nicely in the scopes. Its big, puffy head is mostly feathers -- the better to protect it from snake strikes when it hunts its favorite meal. We heard another chuckling in the distance at Casa Turire. BAT FALCON (Falco rufigularis) – Another good spot by Harry of a bird along the highway on our drive to Universidad EARTH. This species gets its name from its favorite prey, so as you'd expect, it's most active at dawn and dusk. The handsome Trimezia steyermarkii, one of the irises Bruce and Linda identified on the tour. Photo by participant Bruce Sorrie. ORANGE-CHINNED PARAKEET (Brotogeris jugularis) – Our first, in flight over the grounds of the Hotel Bougainvillea, were undoubtedly escaped cage birds -- and the pair near La Mina were probably feral as well. But the multiple pairs we found in the Caribbean lowlands at Universidad EARTH were the real deal, and we saw some of them well enough to note that telltale little orange chin patch. 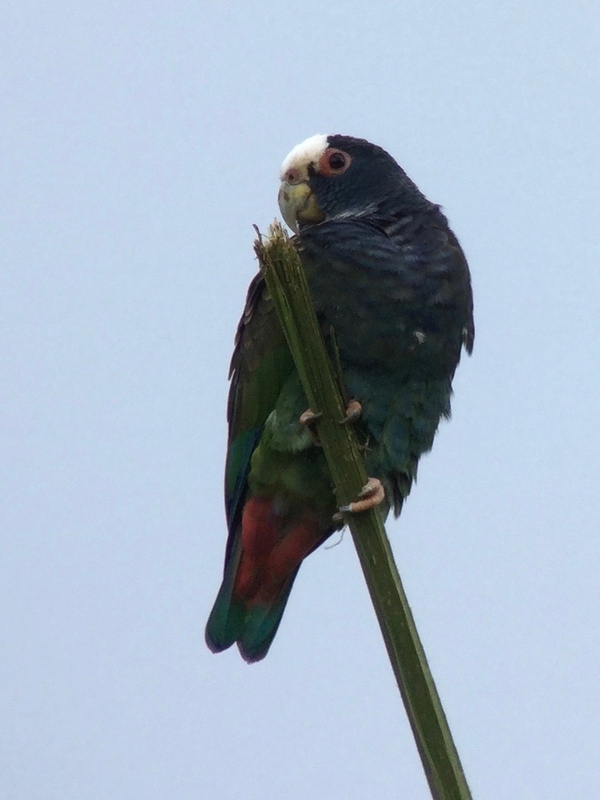 WHITE-CROWNED PARROT (Pionus senilis) – The common parrot of the tour, seen on all but the first day, often in screeching flocks. We had especially nice looks at a small group foraging in one of the trees right off the Rancho balcony one morning. RED-LORED PARROT (Amazona autumnalis) – Small numbers at Universidad EARTH, mostly in flight -- though we did spot a pair perched near the entrance that showed nicely their distinctive red "headband". OLIVE-THROATED PARAKEET (AZTEC) (Eupsittula nana astec) – A flyby pair at Universidad EARTH; these slightly larger parakeets have long, pointed tails instead of the short, squared tail of the smaller Orange-chinned. GREAT GREEN MACAW (Ara ambiguus) – A couple of flyby pairs of these huge parrots neat the entrance to Universidad EARTH -- and the loud, screeching calls of others flying over the primary forest further into the property. This species is endangered and declining, but has recently reintroduced itself back into Costa Rica from neighboring Nicaragua. CRIMSON-FRONTED PARAKEET (Psittacara finschi) – The common parakeet of the trip, seen in good numbers on most days -- and this was another one seen in big, noisy flocks. A small flock perched at the top of one of the trees right off the Rancho balcony gave us our best looks. RUFOUS-RUMPED ANTWREN (Euchrepomis callinota) – A male with the big mixed flock along the Silent Mountain road was a nice surprise; this isn't a species we see very often on this tour. Though he was small and not as colorful as most of the tanagers he accompanied, that red rump sure stood out! GREAT ANTSHRIKE (Taraba major) – A male along the edge of a clearing in the forest at Universidad EARTH twitched in and out of view as it worked its way along, at one point sharing a bush with a bevy of Black-cowled Orioles. BARRED ANTSHRIKE (Thamnophilus doliatus) – Our first was a rusty female in a hedge along the edge of the little marsh near Platanillo. We also had super views of a "jailbird" male in a weedy pasture at Casa Turire. A Green Basilisk keeps a watchful eye on the group. Photo by participant Alicia Jackson. RUSSET ANTSHRIKE (Thamnistes anabatinus) – Those who climbed Rancho's Manakin trail spotted some with a mixed flock they encountered along the way. PLAIN ANTVIREO (Dysithamnus mentalis) – Great studies of a pair gleaning moths from the branches around the moth cloth one morning. CHECKER-THROATED ANTWREN (Epinecrophylla fulviventris) – One or both of a pair seen with a mixed flock each time we walked the Pepper trail. DULL-MANTLED ANTBIRD (Sipia laemosticta) – As usual, we heard far more of these than we saw. Some of the group spotted a singing bird on a steep hillside along the edge of the track at La Mina on our first visit, but it proved very good at keeping to the shadows and the thicker vegetation! PLAIN-BROWN WOODCREEPER (Dendrocincla fuliginosa) – Best seen at the Rancho moth sheet, where a couple of them gleaned insects from the cloth and surrounding shed and forest. We had others from the Rancho balcony and along the Pepper trail. This species is certainly well-named; it had only the barest hint of some vague striping on the face, but was otherwise uniformly brown. WEDGE-BILLED WOODCREEPER (Glyphorynchus spirurus) – One with a mixed flock at Tapanti, identifiable by its small size and small bill. Like all the woodcreepers, it spent most of its time hitching its way up tree trunks. COCOA WOODCREEPER (Xiphorhynchus susurrans) – One of the more common woodcreepers of the tour, seen on four days. The one checking out the skinny trees near Wayne's feeders during each of our visits was particularly obliging, though we saw others near the Rancho moth cloth and near our Laughing Falcon on the way home from Universidad EARTH. SPOTTED WOODCREEPER (Xiphorhynchus erythropygius) – One at the Rancho moth cloth showed its spotty belly nicely as it hitched its way up the poles holding up the shed. The pale markings on the face and underside of this species are clearly round spots rather than linear streaks. The Rufous-collared Sparrow is a common resident in the foothills and highlands throughout Costa Rica, and their sweet songs a regular part of the tour soundtrack there. Photo by guide Megan Edwards Crewe. STREAK-HEADED WOODCREEPER (Lepidocolaptes souleyetii) – Probably the most common of the tour's woodcreepers, seen on most days -- including a few along the Rancho entrance drive and one at La Mina. The thin, curved yellow beak of this species helps to identify it. PLAIN XENOPS (Xenops minutus) – We watched the chickadee-like antics of this little furnarid on several days, including one hanging upside-down from branches around the moth cloth one morning. We saw others along the Rancho entrance road, and near La Mina. 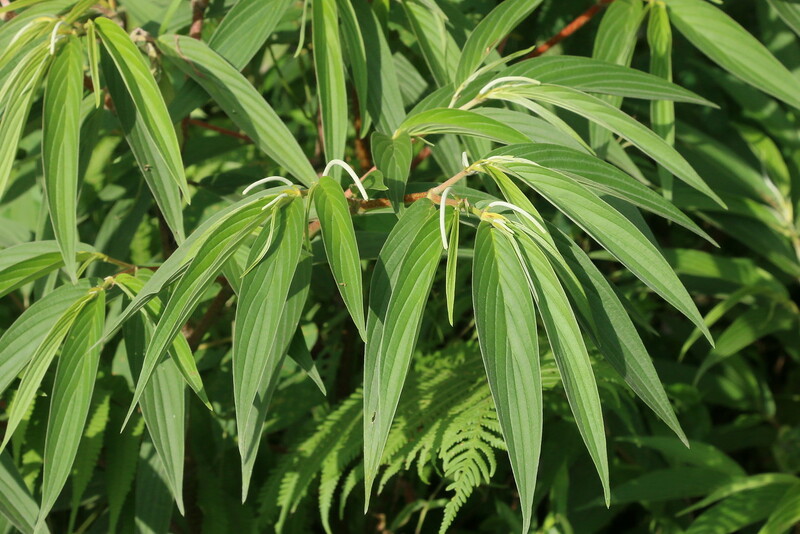 LINEATED FOLIAGE-GLEANER (Syndactyla subalaris) – One in a roadside bush along the Tapanti park road defied identification until it finally turned around. Where's Harry when you need him?! BUFF-THROATED FOLIAGE-GLEANER (Automolus ochrolaemus) – Super views of one gleaning insects off leaves around the Rancho moth cloth one morning, showing his bold pale throat and spectacle nicely. We saw another at Wayne's. SPOTTED BARBTAIL (Premnoplex brunnescens) – With patience, we got some nice views of several along the Tapanti park road, always as part of mixed flocks. RED-FACED SPINETAIL (Cranioleuca erythrops) – A few with one of our mixed flocks at Tapanti. The long, ragged tail of this species is distinctive -- though the red face can be a bit harder to get a good look at. SLATY SPINETAIL (Synallaxis brachyura) – Two along the near edge of the little marshy area outside Platanillo were a bit of a challenge to get a look at, as they skulked through the bushes in front of us. Some saw them well while others saw little more than moving dark shapes! We certainly all heard them though, both there and in the weedy pastures at Casa Turire. YELLOW-BELLIED ELAENIA (Elaenia flavogaster) – One along the hedgerow edging the little marsh near Platanillo, with others in the pastures near Casa Turire. But our best looks came at La Mina, where one of these crested flycatchers hunted near the start of the track along to the river. TORRENT TYRANNULET (Serpophaga cinerea) – One danced along the rocks near our Sunbitterns on the Silent Mountain road, and two others did the same near where we spotted the wood-rail on our way to La Mina. As its name suggests, this little flycatcher is always found near water. OLIVE-STRIPED FLYCATCHER (Mionectes olivaceus) – One flicked through some trees near the edge of the little stream at La Mina, part of a big mixed flock, and we found a second with another mixed flock at Tapanti. The subtly-striped underparts of this species -- and its big, teardrop-shaped eye ring -- are distinctive. OCHRE-BELLIED FLYCATCHER (Mionectes oleagineus) – One along the stream at La Mina on our first visit, not far from where we tried to see our first elusive Dull-mantled Antbird -- great spotting, Darryl! This species has the distinctive habit of regularly flicking one wing. SLATY-CAPPED FLYCATCHER (Leptopogon superciliaris) – One worked along through a vine tangle over the track at La Mina on our second visit, its dark "ear muff" clearly visible. MISTLETOE TYRANNULET (Zimmerius parvus) – Very common, seen or heard nearly every day of the tour -- including one right from the Rancho balcony our first morning. SCALE-CRESTED PYGMY-TYRANT (Lophotriccus pileatus) – A lucky few caught a glimpse of one along the Pepper trail on our last afternoon at Rancho, and we heard the soft trills of another at Tapanti. This little flycatcher is the general shape of a ping pong ball! COMMON TODY-FLYCATCHER (Todirostrum cinereum) – Especially nice looks at two creeping through the viny tangles near Wayne's porch one morning, with others in the vervain hedge at Kathy's, along the Silent Mountain road, and in a bougainvillea patch at La Mina. BLACK-HEADED TODY-FLYCATCHER (Todirostrum nigriceps) – One over the path into Kathy and John's property was nicely cooperative, twitching through a tree right over our heads. YELLOW-OLIVE FLYCATCHER (Tolmomyias sulphurescens) – The one carefully gleaning the vines beside Wayne's porch each morning was particularly obliging; this species can otherwise be a bit of a challenge to see well, as it seems to prefer the higher canopy. TAWNY-CHESTED FLYCATCHER (Aphanotriccus capitalis) – One checking the trees around the Rancho moth sheet gave us views from just about every conceivable angle. This little flycatcher has a very restricted world range: it's found only on the Caribbean slope of southern Central America, and is nowhere common. DARK PEWEE (Contopus lugubris) – One singing from the top of a few emergent trees along the Tapanti road gave us some nice looks. 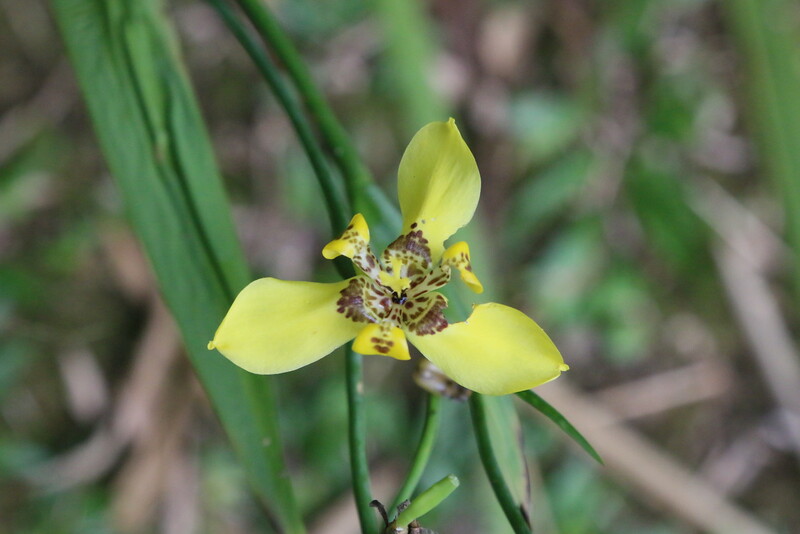 This is another Chiriqui highland endemic. 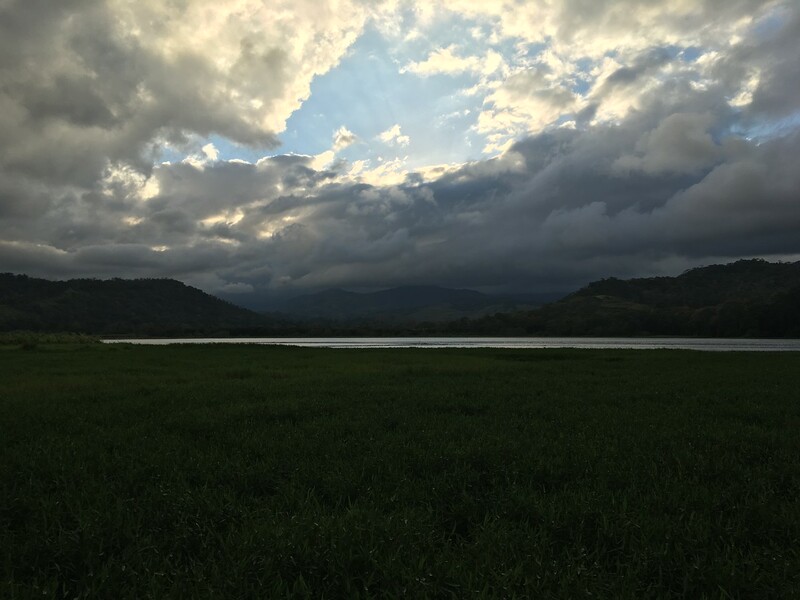 The scenery in much of Costa Rica is nothing to sneeze at! This is a view of the Orosi valley from the highway as we climbed out. Photo by guide Megan Edwards Crewe. TROPICAL PEWEE (Contopus cinereus) – We heard one near the big bridge on Volcan Irazu (while enjoying our Long-tailed Silky-Flycatchers) and another along the Rancho entrance road, and finally laid eyes on one near the houses on our second visit to La Mina. This non-migratory species is shorter-winged than are the wood-pewees found in North America. WHITE-THROATED FLYCATCHER (Empidonax albigularis) – One hunted low in the reeds along the back edge of the little marsh near Platanillo. Compared to the other Empidonax flycatchers on the tour, this one looks quite brown overall. BLACK-CAPPED FLYCATCHER (Empidonax atriceps) – One on the fringes of a mixed flock in the gully near Noche Buena -- nice spotting, Bruce! This distinctively dark little flycatcher is another Chiriqui highland endemic. BLACK PHOEBE (Sayornis nigricans) – Found along streams and around wet spots on most days of the tour, including some hunting from the rocks in the stream at La Mina and others at Casa Turire. BRIGHT-RUMPED ATTILA (Attila spadiceus) – After hearing the maniacal laugh (repeatedly!!) of this big flycatcher from the Rancho balcony on our first morning, we actually laid eyes on one over the cabins nearest to the moth sheet while walking to breakfast the following day. RUFOUS MOURNER (Rhytipterna holerythra) – One hunted along the edge of the road in the forest at Universidad EARTH. DUSKY-CAPPED FLYCATCHER (Myiarchus tuberculifer) – Regular throughout, with especially nice views of a couple over the Rancho moth sheet. This is the smallest of Costa Rica's Myiarchus flycatchers. GREAT CRESTED FLYCATCHER (Myiarchus crinitus) – Heard from the treetops in the forest at Universidad EARTH, but not seen. Some of the birds we heard might have nested in North Carolina! GREAT KISKADEE (Pitangus sulphuratus) – Another widespread species, though somehow we managed to miss them on our first day at Rancho. We must have had our eyes closed! BOAT-BILLED FLYCATCHER (Megarynchus pitangua) – Another common species, including a couple in the garden at Hotel Bougainvillea. The big beak of this species -- and the lack of rufous in the wings and tail -- helps to distinguish it from the Great Kiskadee. SOCIAL FLYCATCHER (Myiozetetes similis) – Seen every day, including a noisy pair in Kathy's garden. This species is welll-named, as single birds are rarely seen; they're typically at least in pairs, and often in larger groups. Participant Alicia Jackson snapped this lovely portrait of a Pale-banded Crescent. GRAY-CAPPED FLYCATCHER (Myiozetetes granadensis) – Small numbers on several days, with especially nice views of a few at the start of the track at La Mina. GOLDEN-BELLIED FLYCATCHER (Myiodynastes hemichrysus) – A few high in trees along the upper stretches of Tapanti's park road, where their rolling calls drew our attention. TROPICAL KINGBIRD (Tyrannus melancholicus) – Abundant throughout, particularly along roadside wires. The twittering call of this species was a regular part of the tour's soundtrack. WHITE-RUFFED MANAKIN (Corapipo altera) – A male with a mixed flock along the Pepper trail, seen by some. WHITE-COLLARED MANAKIN (Manacus candei) – We heard the popping snaps of males on their leks regularly on this tour, and got good views of some single male visitors to Wayne's garden. WHITE-CROWNED MANAKIN (Dixiphia pipra) – A male sitting quietly along the trail out to the forest hummingbird feeders at Rancho was a nice surprise; we don't often see them away from their lekking grounds high on the Manakin trail. BLACK-CROWNED TITYRA (Tityra inquisitor) – One near the Rancho parking lot, seen when we wandered out there after our early morning at the moth sheet, with another pair in a fruiting tree at Universidad EARTH. MASKED TITYRA (Tityra semifasciata) – Alicia spotted our first (in a big stand of bamboo near the entrance to Universidad EARTH), and we found another in the Rancho pasture. The bare, bright-red skin on the face of this species helps to separate it from the previous one. CINNAMON BECARD (Pachyramphus cinnamomeus) – Fairly common, with some particularly nice views of a calling bird in the Rancho pasture. We had others at Universidad EARTH, Silent Mountain and Wayne's garden. WHITE-WINGED BECARD (Pachyramphus polychopterus) – Surprisingly, a female at Universidad EARTH was our only sighting. LESSER GREENLET (Pachysylvia decurtata) – Common throughout, with nice views of a few right over our heads on the road into Kathy's garden. The big pale eye rings of this little vireo are distinctive. 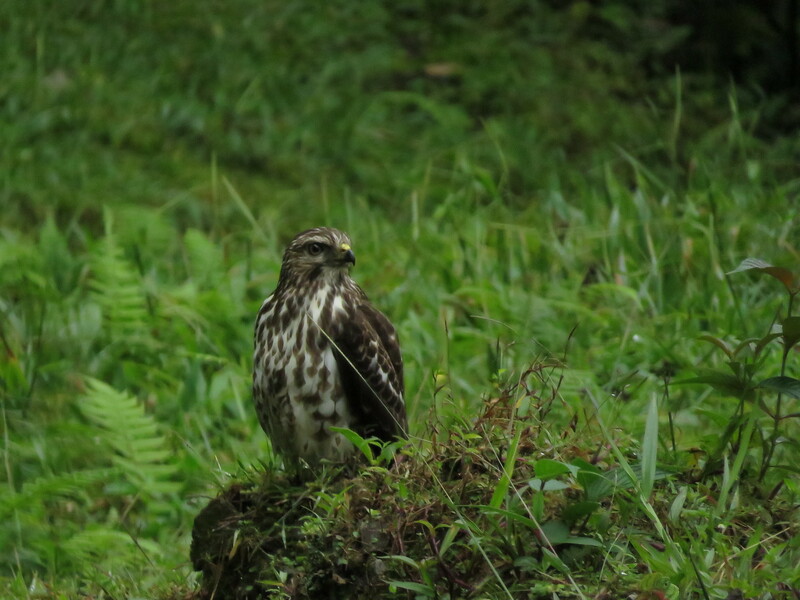 Broad-winged Hawks are abundant passage migrants through Costa Rica, and common overwintering visitors as well. This youngster was along the Tapanti park road. Photo by participant Alicia Jackson. BROWN JAY (Psilorhinus morio) – Common and widespread, recorded every day of the tour -- including some regulars around the Rancho buildings (and feeders!). Their noisy calls were a regular part of the tour soundtrack. BLUE-AND-WHITE SWALLOW (Pygochelidon cyanoleuca) – By far the commonest swallow of the trip, seen every day -- including many flashing low over the vegetation at the very top of Volcan Irazu and others hunting over the pastures and streams around Rancho. NORTHERN ROUGH-WINGED SWALLOW (Stelgidopteryx serripennis) – Regular throughout much of the tour, though missing from the highlands of Volcan Irazu. This is a resident species over much of Costa Rica, but numbers are augmented by winter visitors from further north. SOUTHERN ROUGH-WINGED SWALLOW (Stelgidopteryx ruficollis) – Far less common than the previous species, with a handful coursing over fields or sitting on wires near La Mina. The pale rump patch and buffy throat help to distinguish this from the previous species. GRAY-BREASTED MARTIN (Progne chalybea) – Very common along the highway on our drive to Universidad EARTH, once we'd reached the Caribbean lowlands, sprinkled on roadside wires and buildings or coursing low over roadside fields. This species looks a lot like a female Purple Martin, but with less dingy underparts and no gray on the forehead or nape. MANGROVE SWALLOW (Tachycineta albilinea) – A few at CATIE, but our best views came at Universidad EARTH, where they hunted over the grassy roadside verges and playing fields. The white rump patch of this lowland species is diagnostic. 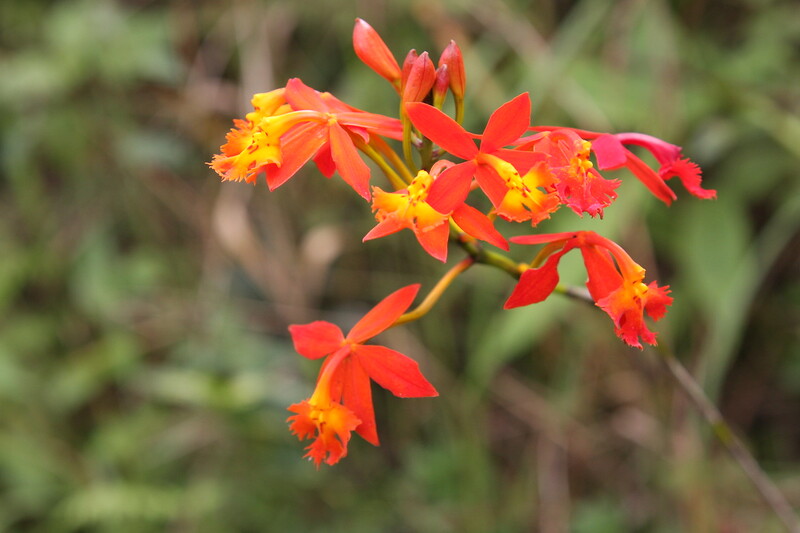 Costa Rica is home to more than 1400 species of orchid, including the lovely Epidendrum radicans, also known as "Fire-star Orchid" and "Rainbow Orchid". Photo by participant Bruce Sorrie. HOUSE WREN (Troglodytes aedon) – Common and widespread -- though heard far more frequently than seen. 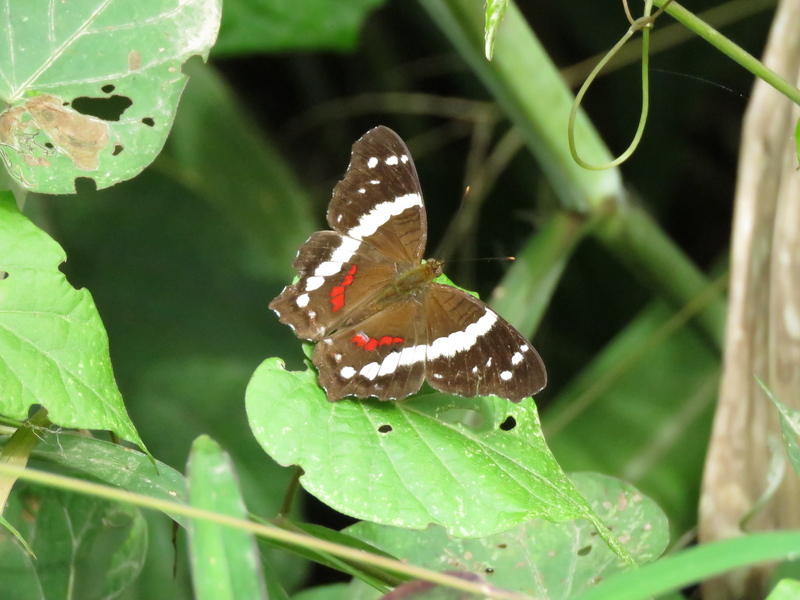 We spotted one in a tangle of brambles near where we parked to look at the sloth, and caught up with another showy bird along the track at La Mina. The subspecies in much of Costa Rica (intermedius) would become the Southern House Wren if the complex were ever split. OCHRACEOUS WREN (Troglodytes ochraceus) – After hearing one singing from one of the big, moss-draped trees in the gully at Noche Buena our first afternoon, we finally laid eyes on one of these tiny rusty wrens in a mixed flock at Tapanti on our final day. TIMBERLINE WREN (Thryorchilus browni) – Arg! A lucky few caught a glimpse or two of one of these highland wrens as a pair flicked through bushes near the dusty caldera atop Volcan Irazu, but most only saw the branches moving slightly. This tiny Chiriqui endemic is always a challenge to see. BLACK-THROATED WREN (Pheugopedius atrogularis) – After hearing the loud whistles of this skulking species along the Rancho entrance road, we were treated to some pretty amazing views of this often-challenging species at Wayne's each morning. This is a large, distinctively dark wren. CABANIS'S WREN (Cantorchilus modestus) – Great studies of a pair working along the stone wall at the edge of one section of the garden at Hotel Bougainvillea on our first morning, with others heard at Wayne's on each visit there. BAY WREN (Cantorchilus nigricapillus) – Wonderful studies of a very confiding family of four right beside the road at Universidad EARTH (seen when we got out to walk across the suspension bridges). We heard others on each visit to La Mina. WHITE-BREASTED WOOD-WREN (Henicorhina leucosticta) – The pair rummaging under the benches and around the poles at the Rancho moth sheet shelter were endearingly confiding, sometimes approaching within mere feet as they searched for hiding moths. We saw others well at Wayne's (also searching for moths) and heard others along Rancho's entrance road. One of the stars of the show was this male Resplendent Quetzal we found on the flanks of Volcan Irazu. Photo by guide Megan Edwards Crewe. GRAY-BREASTED WOOD-WREN (Henicorhina leucophrys) – Great views of a pair working through some trees in the Noche Buena gully. Thanks to our perch on the gully-side, they were about at eye-level! We heard others singing at Tapanti. This is the high-elevation replacement of the previous species. LONG-BILLED GNATWREN (Ramphocaenus melanurus) – One flicked through a dense tangle along the Rancho entrance road on our first morning, showing nicely the extraordinary bill that gives it its name. It looked like it was carrying a toothpick! TROPICAL GNATCATCHER (Polioptila plumbea) – Seen well at La Mina on our second visit. The dark cap of the male makes it look quite different than our familiar Blue-gray Gnatcatcher -- though its restless twitchiness and the long, cocked-up tail are similar. AMERICAN DIPPER (Cinclus mexicanus) – It took a bit of patience -- and more than a bit of careful scanning -- but we finally found a bird working along the stony river far below the Tapanti park road (to Terry's great satisfaction). This little songbird is capable of walking along the bottom of a river or stream! BLACK-FACED SOLITAIRE (Myadestes melanops) – We heard the lovely, ethereal song of this highland species at Tapanti, and caught up with at least one (and possibly more) gobbling berries in a bush along the park road -- not far from the overlook where we found the dipper. BLACK-BILLED NIGHTINGALE-THRUSH (Catharus gracilirostris) – Splendid views of one bathing in the little stream at Noche Buena; it was completely unperturbed by our presence mere yards away. SLATY-BACKED NIGHTINGALE-THRUSH (Catharus fuscater) – Another highland species seen at Tapanti, foraging low along the edge of the park road. The pale eye of this species is distinctive. CLAY-COLORED THRUSH (Turdus grayi) – Abundant and widespread, seen every day of the tour. This is Costa Rica's national bird. SOOTY THRUSH (Turdus nigrescens) – Seen well on Volcan Irazu, where they nibbled tidbits in bushes in the Noche Buena gully and flashed over the flowering bushes around the crater at the summit. TROPICAL MOCKINGBIRD (Mimus gilvus) – A couple along the edge of the road at Universidad EARTH were a bit unexpected; this species (a relatively recent colonist from the northwest) isn't particularly common in the Caribbean lowlands. BLACK-AND-YELLOW SILKY-FLYCATCHER (Phainoptila melanoxantha) – Great views of a few confiding birds feeding in bushes just uphill from the Tapanti park road, giving us great opportunity to study them in the scopes. LONG-TAILED SILKY-FLYCATCHER (Ptiliogonys caudatus) – A busy gang flew to and fro in a gully near the big bridge on the flanks of Volcan Irazu, occasionally posing picturesquely on a lichen-draped dead tree. YELLOW-CROWNED EUPHONIA (Euphonia luteicapilla) – Seen (and heard) regularly throughout the tour, including some showy birds near the houses at La Mina, with others at CATIE and Casa Turire. As its name suggests, the yellow crown spot of the male is particularly extensive on this species. YELLOW-THROATED EUPHONIA (Euphonia hirundinacea) – One along the Silent Mountain road showed its namesake yellow throat nicely. Most of the blue-and-yellow Caribbean slope euphonias have dark blue bibs that extend well down their fronts. This is primarily a Pacific slope species in Costa Rica. OLIVE-BACKED EUPHONIA (Euphonia gouldi) – A few from the Rancho balcony (investigating the fruiting trees beyond the vervain hedges) with others along the Rancho entrance road. The plumage of this species is a bit of an anomaly; both males and females have "female-type" green plumage. WHITE-VENTED EUPHONIA (Euphonia minuta) – A few males among the fruiting trees at the edge of Rancho's pastures showed their distinctive white vents pretty well. The other male blue-and-yellow euphonias on this tour show all yellow underparts. 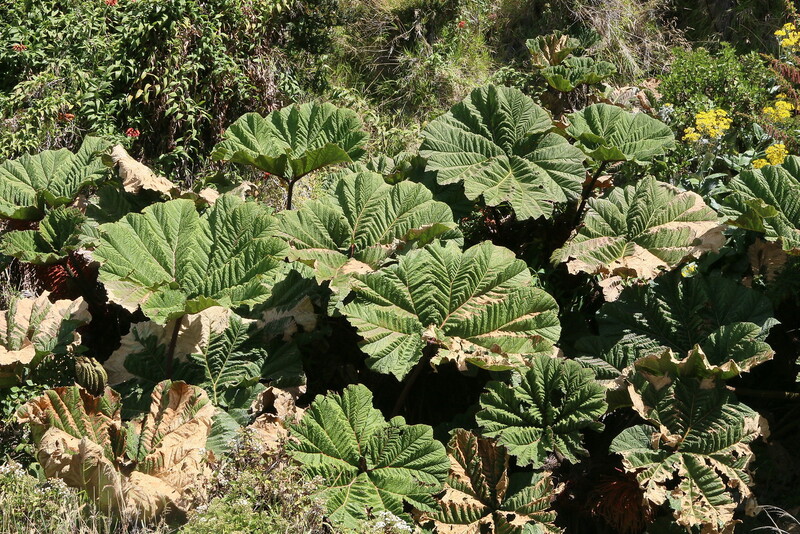 We were impressed by the massive leaves of Gunnera insignis plants at the Volcan Irazu summit. Photo by participant Bruce Sorrie. TAWNY-CAPPED EUPHONIA (Euphonia anneae) – Multiple nice encounters with this distinctive species, particularly in several mixed flocks at Tapanti. We had others on the Silent Mountain road and along Rancho's Pepper trail. That rusty forehead is distinctive -- at least on the male. ASHY-THROATED CHLOROSPINGUS (Chlorospingus canigularis) – Most of the group got on one with the big mixed flock along the Silent Mountain road. This is the plainest-headed -- and least common -- of the three chlorospingus we saw on this tour. SOOTY-CAPPED CHLOROSPINGUS (Chlorospingus pileatus) – A little gang swirled through the trees in the gully at Noche Buena, making plenty of noise as they went; their bold white eyebrows were certainly eye-catching. This is a highland species, typically found above 2000 m.
COMMON CHLOROSPINGUS (Chlorospingus flavopectus) – Abundant at Tapanti, where they swarmed through the trees in big flocks. BLACK-STRIPED SPARROW (Arremonops conirostris) – One flicked along the fence line at the back of the little marsh near Platanillo, and another came closer and closer through a line of bushes in a garden at La Mina. 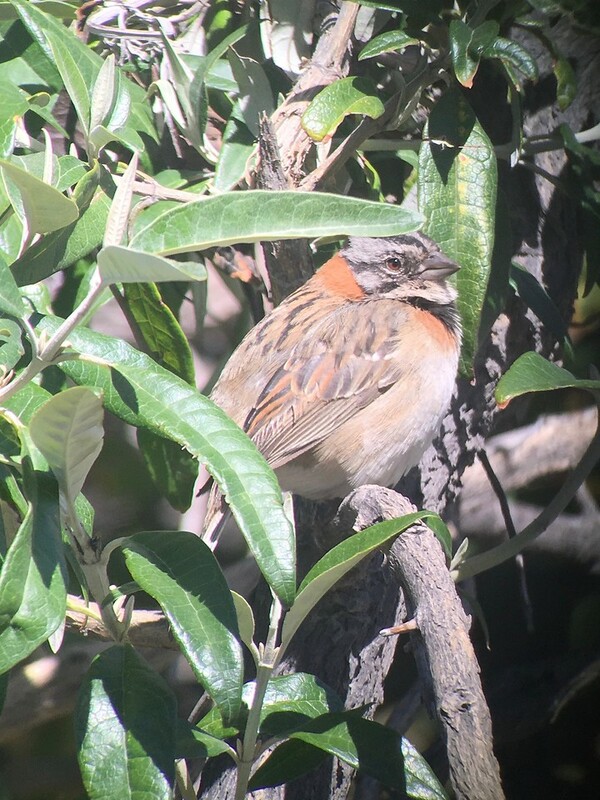 ORANGE-BILLED SPARROW (Arremon aurantiirostris) – Great views of one scuttling under the vervain hedges below the Rancho balcony on several mornings, with another bathing at the hummingbird pools. VOLCANO JUNCO (Junco vulcani) – It took a bit of effort -- and a lot of filtering out of Sooty Thrushes and Slaty Flowerpiercers -- but we finally found one along the edge of the crater at Volcan Irazu. RUFOUS-COLLARED SPARROW (Zonotrichia capensis) – Some great views on our early morning exploration of the garden at the Hotel Bougainvillea with plenty of others on Volcan Irazu -- where we also had some nice serenades. We saw others at La Mina, and along the road en route to Tapanti. LARGE-FOOTED FINCH (Pezopetes capitalis) – Superb studies of a confiding pair along the fence line in the gully at Noche Buena -- and those feet DID look big! This dark-plumaged species is another Chiriqui highland endemic. EASTERN MEADOWLARK (Sturnella magna) – A few singing in the fields around Casa Turire gave us a preview of spring in North America. RED-BREASTED MEADOWLARK (Leistes militaris) – Also found in the weedy pastures around Casa Turire, where the bright red breasts of the males made them easy to spot. In flight, the dark back and red shoulders of the males make them look a bit like Red-winged Blackbirds. We had some great moths on this tour, mostly around the insect lights at Rancho and Wayne's. This huge one is Letis buteo; members of this genus are often called "witches". Photo by participant Alicia Jackson. YELLOW-BILLED CACIQUE (Amblycercus holosericeus) – A few folks got a quick look at one in some dense shrubs along the edge of the little marsh near Platanillo. This can be quite the skulker! CHESTNUT-HEADED OROPENDOLA (Psarocolius wagleri) – Less common than its larger cousin, but seen well on a number of days of the tour -- including one perched up on the top of a flowering immortelle tree down the hill from the Rancho balcony on our first morning there. MONTEZUMA OROPENDOLA (Psarocolius montezuma) – Abundant throughout, with close looks at many as they raided the banana feeders near the Rancho dining room. We watched a few males doing their somersaulting courtship displays, raising their yellow tails and quivering their wings as they hung upside down. SCARLET-RUMPED CACIQUE (Cacicus uropygialis) – A few in a clearing along the forest track at Universidad EARTH showed the red rump patches that give them their name when they flew. BLACK-COWLED ORIOLE (Icterus prosthemelas) – Nice views of several of these handsome orioles at Universidad EARTH, particularly along the more open stretches of the main road. This species is primarily found on the Caribbean slope of Costa Rica, but its range has expanded onto the Pacific slope over the past 10-15 years. BRONZED COWBIRD (Molothrus aeneus) – We spotted scores dotting roadside wires on our drive through the Tuis valley on several early morning outings. GIANT COWBIRD (Molothrus oryzivorus) – One that snuck in and checked out the activity near the Rancho balcony on our first morning was a bit of a surprise; they're not common at that site. More typical were the dozens we found clustered around the feet of the horses at Casa Turire. This species is a brood parasite of oropendolas and caciques. MELODIOUS BLACKBIRD (Dives dives) – Seen (and heard) well on the grounds of the Hotel Bougainvillea on our first morning, and near the start of the track at La Mina on our second visit there. Amazingly, this species was first recorded in the country in 1987; now it's widespread over much of Costa Rica. GREAT-TAILED GRACKLE (Quiscalus mexicanus) – Daily, often in sizable numbers. A big adult male Green Iguana defies his name. Photo by participant Alicia Jackson. GRAY-CROWNED YELLOWTHROAT (Geothlypis poliocephala) – One sang from a treetop at the little marsh near Platanillo -- nice spotting, Linda! This species doesn't have much of a black mask. OLIVE-CROWNED YELLOWTHROAT (Geothlypis semiflava) – A noisy individual at the little marsh near Platanillo announced his ownership of the area from a series of perches along the living fence behind the marsh. We heard others singing at Laguna Angostura and La Mina. TROPICAL PARULA (Setophaga pitiayumi) – Our first was a male, poking its way through the branches over our heads as we walked the driveway up to Kathy's house. We saw another with a mixed flock in the guava orchard at Rancho. RUFOUS-CAPPED WARBLER (Basileuterus rufifrons) – A pair seen very well at Wayne's on each of our visits as they thoroughly checked the patches of dense tangles along the edge of the yard near the insect light. GOLDEN-CROWNED WARBLER (Basileuterus culicivorus) – A pair with a mixed flock along the Pepper trail one morning, with others (or the same ones) heard in the same area late in the afternoon on the following day. COSTA RICAN WARBLER (Basileuterus melanotis) – A handful boiled through trees along the edge of the Tapanti park road, showing their distinctively striped crowns. This is the newest Chiriqui highland endemic, recently split from the Three-striped Warbler. BUFF-RUMPED WARBLER (Myiothlypis fulvicauda) – After hearing one calling along the river at Universidad EARTH, we caught up with a busy pair working along the little stream at La Mina. That bright rump patch is distinctive -- and eye-catching. The handsome Golden-hooded Tanager was seen well on many days of the tour. Video by guide Megan Edwards Crewe. SLATE-THROATED REDSTART (Myioborus miniatus) – A handful of these flashy warblers caught our attention in various mixed flocks we encountered at Tapanti. The birds seen in Costa Rica are yellow-bellied; further north (for instance, in Mexico) they're red-bellied. DUSKY-FACED TANAGER (Mitrospingus cassinii) – Two along the edge of a clearing in the primary forest at Universidad EARTH were a bit skulky when they first moved out to a nearby clump of ferns and bushes, but eventually popped up where we could see them. 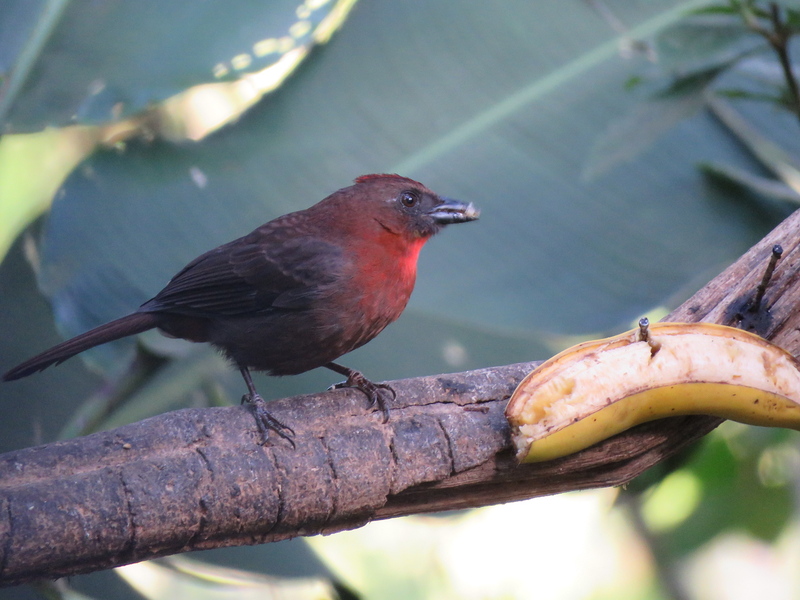 This distinctively dark tanager tends to stay fairly low in dense vegetation. RED-THROATED ANT-TANAGER (Habia fuscicauda) – Splendid studies of both males and females around the Rancho moth sheet, with others in the undergrowth at Wayne's. Like the previous species, this one is now known to be more closely related to the cardinals than to the true tanagers -- despite its name! BLUE-BLACK GROSBEAK (Cyanoloxia cyanoides) – Best seen at La Mina on our first visit, when we found one singing from some bushes between the path and the river. WHITE-SHOULDERED TANAGER (Tachyphonus luctuosus) – Regular members of mixed flocks in the Caribbean lowlands and foothills, including a pair with the big flock we encountered on the Silent Mountain road and others in the pasture (and along the driveway) at Rancho. This bold white mark on the male's shoulder is an obvious field mark. WHITE-LINED TANAGER (Tachyphonus rufus) – Particularly nice looks at a pair -- black male and rusty female -- at the little marsh near Platanillo, with others along the Rancho driveway and at La Mina. The whole underwing of the male is white. SCARLET-RUMPED TANAGER (Ramphocelus passerinii) – Common throughout, including colorful flocks flitting along the edge of the Rancho driveway each time we drove down. The two subspecies -- passerinii of the Caribbean slope and costaricensis of the Pacific slope -- were formerly considered separate species. 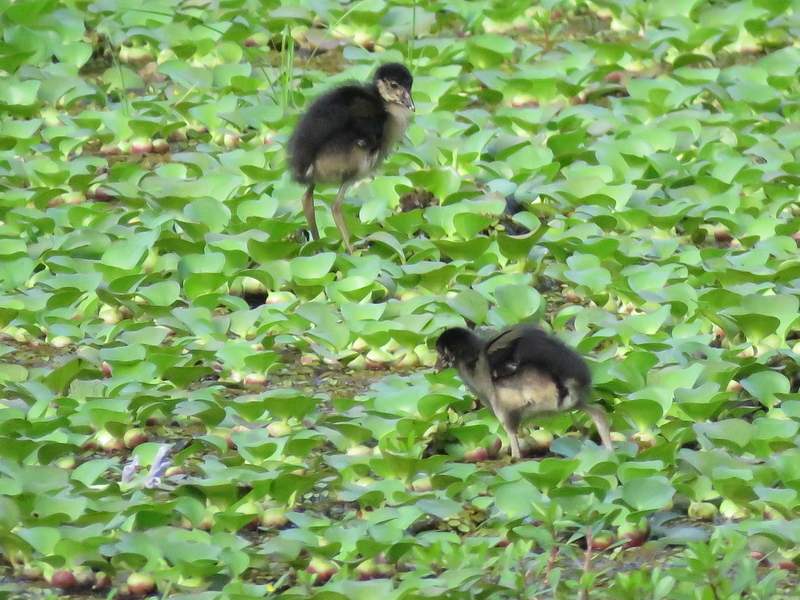 A couple of baby Purple Gallinules tiptoe across the vegetation on the pond at CATIE. Photo by participant Alicia Jackson. BLUE-GRAY TANAGER (Thraupis episcopus) – Abundant throughout, seen well every day -- usually in pairs. PALM TANAGER (Thraupis palmarum) – Another widespread species, seen (and heard) in big numbers daily. This is certainly one of the drabbest of Costa Rica's tanagers. SPECKLED TANAGER (Ixothraupis guttata) – At least two flitted through some fruiting trees along the edge of the pasture at Rancho, showing the black speckles that give them their name. This is a mid-elevation species in Costa Rica. GOLDEN-HOODED TANAGER (Tangara larvata) – Another common species during the week, seen well on many days -- including a confiding bird sitting quietly in a little shrub right beside the Silent Mountain road, and in the trees just off the Rancho balcony. PLAIN-COLORED TANAGER (Tangara inornata) – A trio of these small tanagers, which look a bit like smaller, darker-headed Palm Tanagers, in a tree along the main road at Universidad EARTH, with others near the start of the track at La Mina. BAY-HEADED TANAGER (Tangara gyrola) – Small numbers in scattered mixed flocks, including a few with the Speckled Tanagers in fruiting trees near Rancho's pasture our first morning there, with others along the Silent Mountain road and at La Mina. The birds in Costa Rica have deep turquoise-blue underparts, quite unlike the green breasts and bellies of birds found further south. EMERALD TANAGER (Tangara florida) – Super views of a handful of birds along the Silent Mountain road, where they gleamed against the dark mossy branches of a tree over the road. This uncommon species is found almost exclusively in mixed flocks. SILVER-THROATED TANAGER (Tangara icterocephala) – Another species seen marvelously well in that big mixed flock along the Silent Mountain road. This species looks quite yellow overall. SCARLET-THIGHED DACNIS (Dacnis venusta) – Very common throughout, with some stunning views of a few in the fruiting trees along the edge of the Rancho pasture. A lucky few even saw the (typically hidden) scarlet thighs of the adult male! BLUE DACNIS (Dacnis cayana) – Far less common than the previous species, with only one clear sighting -- a few birds in trees near where we stopped along the highway to scope our sloth. We saw several females, which are pale green with a bluish head. RED-LEGGED HONEYCREEPER (Cyanerpes cyaneus) – A few folks got a look at one, showing its red legs, in a little flock with the previous species along the road where we found our sloth. GREEN HONEYCREEPER (Chlorophanes spiza) – Seen most days of the tour, with far more turquoise males males than green females spotted. The snazzy flowers of Centropogon granulosus reminded some of us of candy corn. Photo by participant Bruce Sorrie. BLACK-AND-YELLOW TANAGER (Chrysothlypis chrysomelas) – Lovely looks at a few of these small tanagers with a mixed flock swirling along the edge of the Silent Mountain road. The males look amazingly like Prothonotary Warblers! SLATY FLOWERPIERCER (Diglossa plumbea) – Abundant on Volcan Irazu, where they regularly distracted us during our search for Timberline Wren and Volcan Junco. We got to see the nectar-thieving beak of one female nicely when she sat in a bush right beside the track up to the summit -- that little hook is perfect for carving a hole at the base of a tubular flower! BLUE-BLACK GRASSQUIT (Volatinia jacarina) – A handful foraged for seeds in the weedy margin of the little marsh near Platanillo, and others rummaged along the roadsides at Universidad EARTH. THICK-BILLED SEED-FINCH (Sporophila funerea) – One in a field near the start of the track at La Mina provided a nice comparison with the next species, showing its larger bill. We saw others at the little marsh near Platanillo. VARIABLE SEEDEATER (Sporophila corvina) – Fairly common, particularly in more open areas we visited, including some around the pastures at Rancho, and others along the roadside at Universidad EARTH. Males of the subspecies found on Costa Rica's Caribbean slope are entirely black, with a small "pocket handkerchief" of white on the wing. Pacific slope birds have far more white in their plumage. BANANAQUIT (Coereba flaveola) – One or two from the Rancho balcony, with other scattered individuals along the driveway. As several of you noted, they look a bit like tiny, curve-billed kiskadees. YELLOW-FACED GRASSQUIT (Tiaris olivaceus) – Lovely views of some bouncing across the lawn under the Rancho balcony, with others along the Silent Mountain road and near the start of the track at La Mina. The females don't show much of a yellow face. BUFF-THROATED SALTATOR (Saltator maximus) – Seen on most days, including several little groups along the Rancho driveway, and a couple of showy birds at Wayne's. BLACK-HEADED SALTATOR (Saltator atriceps) – Best seen at the little marsh near Platanillo, where a noisy gang swarmed through some trees across the road, and near the bridge where we found our Sunbitterns on the Silent Mountain road, where a handful of them posed in the open for scope looks. This is the biggest of Costa Rica's saltators. GRAYISH SALTATOR (Saltator coerulescens) – A small group on the grounds of the Hotel Bougainvillea our first morning were cooperative, as were others along in an open field along the track at La Mina. The bold white eyebrow of this species is distinctive. A dramatic sky over Laguna Angostura capped our afternoon there. Photo by guide Megan Edwards Crewe. LONG-NOSED BAT (Rhynchonycteris naso) – Several little groups of them hung from the ceiling of the chapel where we ate our lunch at Universidad EARTH. They were definitely making a mess of some of the pews! MANTLED HOWLER MONKEY (Alouatta palliata) – We heard the throaty growls of at least one troop in the primary forest at Universidad EARTH, but unfortunately, they were too far away to see. WHITE-THROATED CAPUCHIN (Cebus capucinus) – A small group along the edge of the Tapanti park road were a nice surprise -- and quite entertaining! BROWN-THROATED THREE-TOED SLOTH (Bradypus variegatus) – Some great spotting by Luis of one coiled like a shaggy bit of carpet chucked up into the top of a Cecropia tree along the highway, seen on our way back to Rancho after our visit to Universidad EARTH. When we'd parked on a stubby side road and put the scopes on it, we could actually see one long, outstretched arm with three razor-sharp claws at the end, holding on to one of the branches. BRAZILIAN RABBIT (Sylvilagus brasiliensis) – Terry and Maggie spotted one along the Rancho entrance road on our first morning there. VARIEGATED SQUIRREL (Sciurus variegatoides) – Abundant throughout, with a variety of color morphs seen. They certainly appreciated all the bananas put out on the feeding station at Rancho! RED-TAILED SQUIRREL (Sciurus granatensis) – The smaller of the squirrels we found on the tour, also seen well at the Rancho banana feeders. They regularly absconded with fruits that were nearly as large as they were! DUSKY RICE RAT (Melanomys caliginosus) – One scurried out from under the vervain hedge below the Rancho balcony several times to grab a hurried mouthful of corn meal before zooming back into cover. We saw it only on our first morning there. CENTRAL AMERICAN AGOUTI (Dasyprocta punctata) – One stepped delicately along the back edge of the grassy clearing below the Rancho balcony one morning, pausing for only a few seconds before melting back into the forest. WHITE-NOSED COATI (Nasua narica) – Regular throughout, including one parading around the parking lot of Volcan Irazu (attracting lots of photographers and handouts) and one raiding the Rancho banana feeders most mornings. LONG-TAILED WEASEL (Mustela frenata) – A few of us happened to be looking in the right direction when one of these fierce little predators scampered across the road. 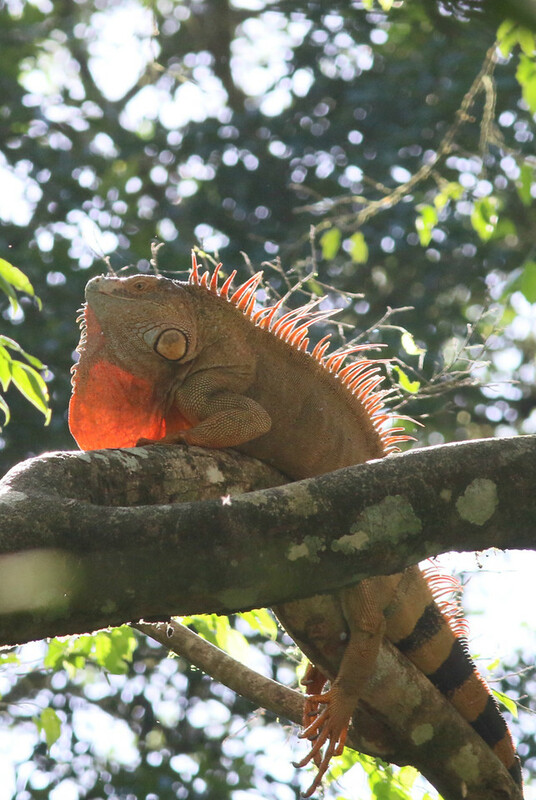 GREEN IGUANA (Iguana iguana) – Scope views of a big orange male in a tree over the pond at CATIE, with others at Universidad EARTH. 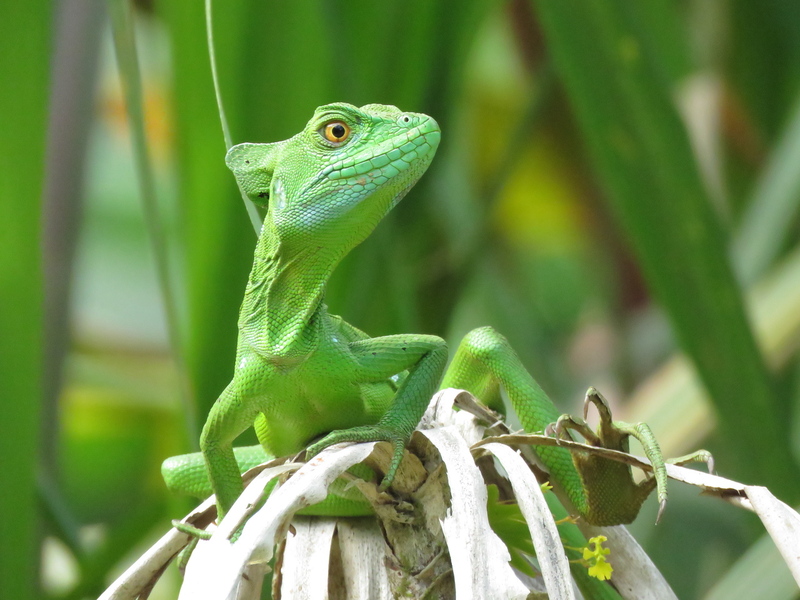 GREEN BASILISK (Basiliscus plumifrons) – One atop some weeds at La Mina proved nicely photogenic. This species is locally known as the 'Jesus Christ Lizard' for its ability to run across the top of short stretches of water. CENTRAL AMERICAN CORAL SNAKE (Micrurus nigrocinctus) – We found a small one in the grass near the restrooms at the entrance to Universidad EARTH; it eventually coiled itself under a small rock near the parking lot -- where it was nearly invisible. This is largely a nocturnal species.